Population: The population count for the Town of Smithfield as of April 1, 2010 (last census), was 21,430. This represented a 4.0% change (817) from the 2000 population of 20,613. The population count for the Town of Smithfield as of April 1, 2000 was 20,613. This represented a 7.6% change (1,450) from the 1990 population of 19,163. Population Density: Smithfield contains 26.589 sq. miles of land area and 1.181 sq. miles of water area. Total area is 26.77 square miles. The 2010 population density of Smithfield is 806 persons per square mile of land area. Population Rank: In 2010 Smithfield ranks 17th in population among Rhode Island’s 39 cities and towns. 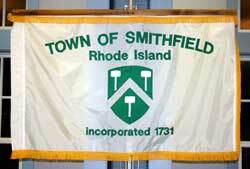 In 2000 Smithfield ranked 18th in population among Rhode Island’s 39 cities and towns. Median Age: In 2010, the median age of the population in Smithfield was 40.7. In 2000, the median age of the population in Smithfield was 38.7. Government: Appointed Town Manager. Elected 5 member Town Council (elected at large for 2-year terms). Elected 5 member School Committee (elected at large for staggered 4-year terms). Location: 11 miles NW of Providence. Time Zone: GMT-5. Daylight Saving Time observed from the second Sunday in March to the first Sunday in November. Incorporated: The year of incorporation is 1730 (Julian calendar), 1731 (Gregorian calendar). Villages: Many sections of Smithfield have their own distinct names, they include Esmond, Greenville, Spragueville, Mountaindale, Georgiaville and Stillwater. These village names grew out of the several mill villages that were established in the middle 1800’s.